Home/Vacation Rental/Are you renting your holiday home for short term period? What started with one autonomous region in Spain, gradually spread to most of the regions. Out of them, the Andalusia’s draft sparked most controversy. The autonomous region of Andalusia approved its Holiday Rental Law 2 years back in February 2016. A lot of Home owners who are finding their guests on various online portals like Airbnb, HomeAway, Trip Advisor, etc were in a state of confusion as there was not much clarity on what needs to be done to comply with the law. It is important to understand which properties are covered by law. A lot of Home owners took help from Property Management companies to comply with laws. Now after 2 years since the law came into place, let us take a look at the current scenario. Properties which are rented for a continuous period of more than 2 months. Over 2 months, Tenancy Act will be applied and needs to be complied with. Home Owners or Property Management companies that own or rent three or more properties each located within 1 km radius from reception office in same unit. They have a different set of restrictions to be followed. Properties located in residential areas. Serious Offence which may lead to temporary shut-down of premises for period upto 6 months and fine ranging from €2000 to €18000. Very serious Offence with fines ranging from € 18000 to €150000. The premises may be shut down for a period of 6 months to 3 years and license may be revoked indefinitely. All landlords who wish to rent out their properties are required to register their property before the ATR (Andalusia Tourism Register). 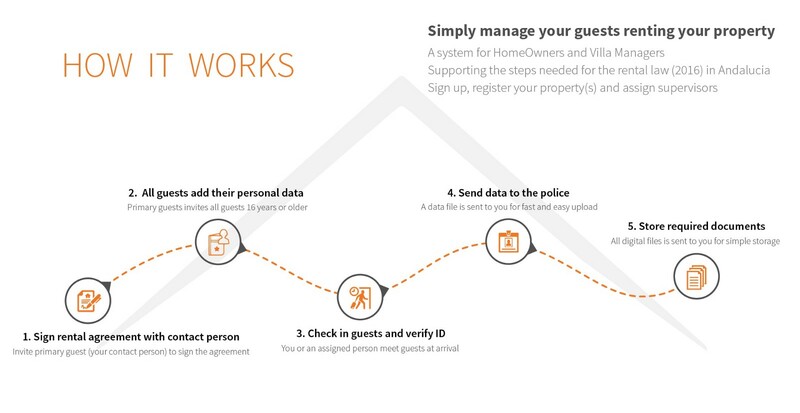 Once registered, a unique property number and password will be provided which can used to login on Policia portal and add details about your guests. The property can be rented in its entirety or room wise. When the whole property is rented, the maximum occupancy of guests cannot exceed 15 with maximum capacity of 4 guests per room. The Law also requires to have the rental agreement signed with the guests and their details updated on the policia platform. We have seen lots of home owners and Property management companies adding their guest details manually to policia once the guest arrives on premises. This has increased lot of paper work and made the whole process tedious. This is where PlusGuests comes into picture. They not only help you provide online Guest Management services but also generate the required documents in required formats as specified by law. All you need to do is add your guest details and verify on their arrival. PlusGuests will generate Guest documents which are to be stored in hard copy for minimum of 3 years from date of arrival of guests. PlusGuests also generate the data file which can be directly uploaded on the policia website. You don’t need to manually update guest information of each and every guest for each Property. Just upload the datafile and relax.